The first year that I started seeds indoors, I just used good old natural light.. you know... a window. No matter what anyone says, you definitely need something stronger than even the sunniest southern facing window to successfully start seeds. I don't know brand it was (it has long since been disassembled here and the only things I still use are the trays!). It was used and I bought it on eBay. I think the seller said it came from an estate sale and I definitely spent well under $100 for it. Sadly, it didn't have high output bulbs (and I didn't realize at the time just how much high output bulbs are needed). It did work better than the window (anything would work better than that! ), but it still wasn't that great. Seeds grew, but they were still rather spindly. I'm pretty sure that it was due to the bulbs. The new systems like this all seem to come with high output bulbs so I still think that this is a good starter system. But, for me, this little shelf system quickly became WAAAAY too small... I needed more shelves and more space. Upping my seed starting game. 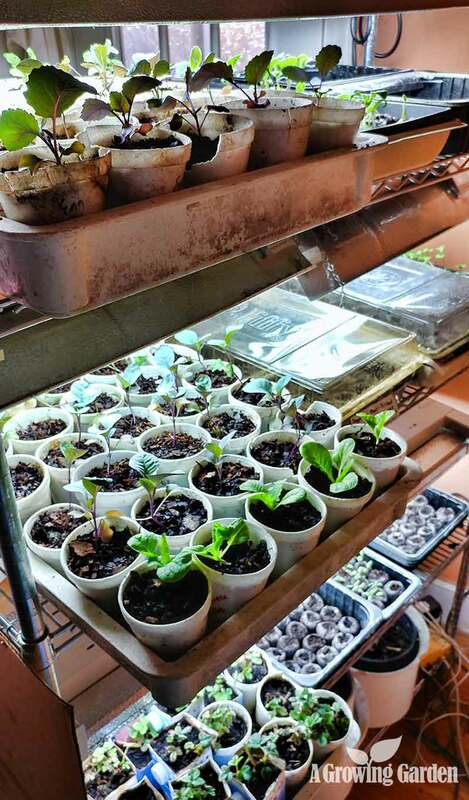 No doubt, seed starting racks and lights can get pretty expensive... REALLY expensive. You can easily spend $500 for a small rack with just a few shelves and lights, let alone what larger systems cost. I didn't want to plop down big bucks on a new system, but I also wanted something much bigger and better than what I had or what I could buy for the same amount of money. So, I built my own growing stand, piece by piece, using shelves that I bought at Costco, T5 grow lights bought on Amazon, and trays bought on eBay (and scavenged from wherever I could find something that worked!). Building it was a process and I think I just had one light fixture the first year and slowly have increased to a total of five, 4 foot light fixtures. It's still a work in progress and I am always refining things like swapping out lights, adding shelves, changing how the lights are attached, re-arranging trays, and moving shelves and lights. I've also been thinking hard about moving to LED lights, but so far I've decided that the price just isn't worth it yet.... maybe I'll move over to LED in the next few years, but for now I'm sticking with my high output T5 lights. They work really well! A 48" x 18" x72" Commercial Steel Shelving Rack from Costco: We have tons of these shelving racks in our house, in the garage, and in our studio. They are fantastic and we use them for all sorts of things. The racks come with 6 adjustable shelves and the whole thing is on wheels, so it's easy to move around if needed. They are 4 feet wide, so standard 4 foot light fixtures fit perfectly on each shelf and they are deep enough for most of my trays. They hold something like 500 pounds, so I can really get a lot of large plants and pots on the shelves if needed, and since we have so many sets of these racks, we almost always have an extra shelf around that I can add to my grow rack if I decide to start more seeds. I use just about anything else I can find for trays too. 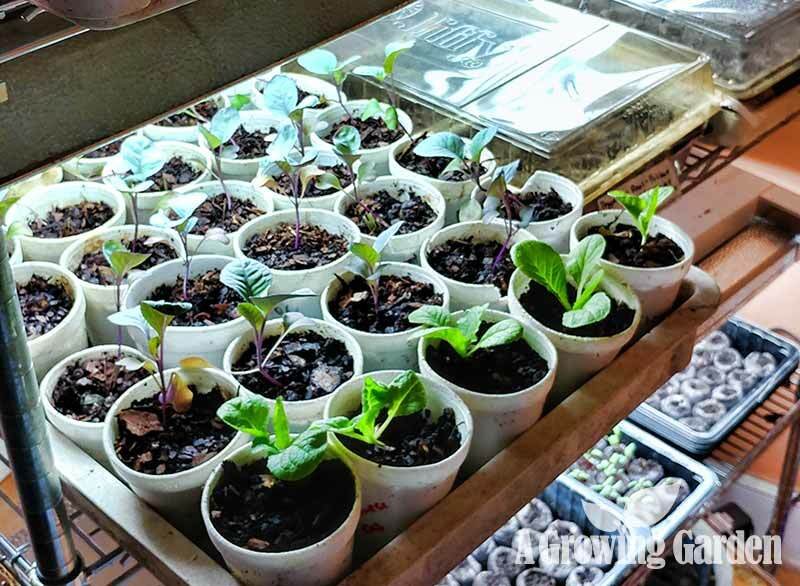 I have flimsy, plastic seed trays purchased from garden centers (I don't buy these anymore -- they are just too flimsy and only last a few years). I use old cake pans. I also use plastic trays that our local grocery used to sell hamburger in (sadly they no longer use these trays, but I have a bunch of them and they are great!). Really, anything can work! All in all, my indoor seed starting set up may not be pretty, but it's big, it's functional, and it works really well! ps ... I also have a homemade incubator and seed germination chamber that I will write about soon. It's built from a huge, old cooler, a lightbulb, fan, and a temperature controlled electric switch.